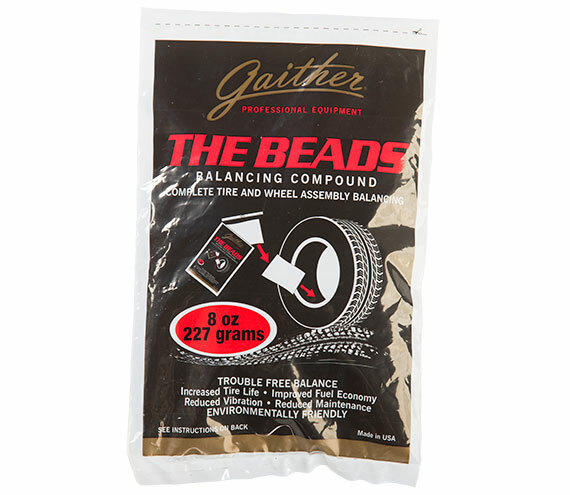 The Beads - Gaither Tool Co. Balancing large wheelsets on machines can be a time-consuming process. Gaither’s BEADS offers another balancing option for those looking to increase the efficiency of their service. All you need to do is match the tire dimensions with the correct application bag size by using THE BEADS application chart or our mobile phone app, available on the Apple App Store and Google Play Store. Once you have selected the correct bag size all that is left to do is throw the inner bag inside the tire cavity and mount the tire as you would normally, then use the included valve core to inflate. Order now and get a free Application Poster! Only available while supplies last.